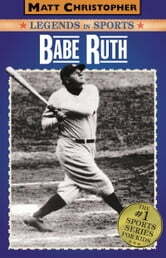 In a career that spanned over thirty years, George Herman "Babe" Ruth changed the way the sport of baseball was played. He was the first true power hitter, a strong pitcher, and in the outfield made some amazing game-saving catches. His love of the sport shined through in the way he laughed while jogging around the bases, in how he kidded and horsed around with teammates, and in his overall determination to win. But there was a darker side to Babe, one that nearly ruined his career - and his life. In the end, however, Ruth managed to overcome his personal demons, recapture his health, and go on to lead his beloved Yankees to championship status. Simply put, there has never been another player like the Babe. This comprehensive biography of one of baseball's most memorable legends also comes with photos.